There are book people. There are TV people. There are movie people. I’m definitely a movie person. If by movie person, you mean a person who has seen at least one in movie in their lifetime. I like movies a lot. But I forget when they’re in theatres or I fall asleep when I’m watching them. Admittedly, these are lame reasons. But the movies that I see, I love. Including, but not limited to, Dumb & Dumber. When I saw the trailer for the movie Chef, I was really excited. 1) I love food. 2) I recently saw Swingers with my framily, Anna and Kevin, and really enjoyed it. (I’m just now getting to movies from 1996. Next up, Sling Blade!) 3) And I love Jon Favreau. C’mon, you know Elf is one of the movies I’ve seen. My framily and I decided to get a bite at Mission Pizza and see the movie when it opened at Aperture Cinema last weekend. And this was a wise call. This is not a film you can see on an empty stomach. The movie is terrific. Sure, it’s really focused on the food. The basic storyline is about chef who has a meltdown and reignites his passion by starting a food truck. And the food part of the movie does not disappoint. Jon Favreau partnered with Roy Choi, who is often credited with starting the food truck movement with his Kogi truck out in LA. Fun fact: like Favreau’s Avengers movies, there’s a little bonus clip of Roy Choi mentoring Jon Favreau in how to cook the perfect grilled cheese after the credits roll. A little nerdy, but worth the wait. 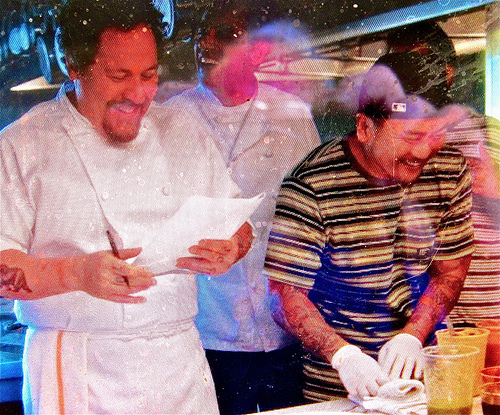 Artsy shot of Jon Favreau and Roy Choi via Huffington Post. The food in the movie will make your jaw drop. Bacon and brisket and roast pork, oh my. But this movie is so much more. It’s about relationships. It’s about overcoming creative stagnancy and unleashing your passion. It’s about family and love. It’s well written, it’s well acted, it’s funny and fun. Go to your favorite restaurant—or be bold and try something new—and then go see this movie. You will not be disappointed. Then go home, make a batch of them French fried potatoes and watch Sling Blade. I love you. I want to make that clear at the start of my comment rant. Okay. I won’t rant. I will say that I thought the movie “Chef,” which I rushed out to see for all the same reasons as did you (including, but not limited to, Jon Favreau), sucked. My being a vegan aside (I can appreciate beautiful and creative food. HELLO, camera shots of chopping vegetables at warp speed get to me just as much as the carnivore next to me. ), the movie was waaay too long, had lousy character development, and lacked sufficient plot development. I just kept wondering why? And if they weren’t going to develop the story and tighten up its telling, the least they could have done is to show us more food. With loads of vegan love.